Before I had children there were certain rhythms in my life that came easily. I had a job that required occasional long hours and frequent travel, but for the most part alone time was available whenever I wanted, to do as I pleased. Even with the demands of a job, being a wife, and keeping our home in order, reading and studying my Bible on a daily basis was attainable. 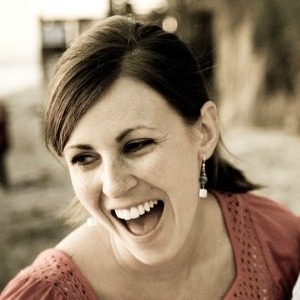 With motherhood a lot of things changed and reading my Bible was one of them. I wasn’t guaranteed any moments of quiet, and I was often too tired to use any quiet time that I did have for Bible reading. I would sit down and open my Bible to read and pray like before, but I would either fall asleep or my thoughts would be so incoherent that nothing would make sense and it felt useless to try and have a meaningful time with the Lord. Some people advised me to let my devotional life go, and encouraged me by saying there would be a day when I could come back to regular and impactful Bible study, but I needed to give myself grace and not feel guilty about a ‘lesser’ or completely absent devotional life. A part of me wanted to agree with them that yes, it would be okay. “God knows I’m tired, surely he will make up for what I can’t do right now.” It wasn’t long, though, before the very nature of motherhood revealed the condition of my heart, sins and weaknesses surfacing every day as I grew into the responsibilities and demands of being a mom. I quickly realized that time spent with the Lord through journaling, reading the Bible and prayer, was needed more than ever before. But how was I going to make that happen? Did I get up early? Should I stay up late? Would I forever have to neglect other aspects of my life in order to make time for Bible reading and prayer? How would I ever find the time and energy to make sense of what I read? Motherhood has required that I put more effort into maintaining my daily time with the Lord, especially through these years of raising little ones. And while my devotional life isn’t perfect, I have found a few things to be helpful in keeping it a priority. Teach your children the importance of your time alone. When my children were old enough to get out of their beds in the morning, they would often come downstairs while I was still reading my Bible. From the beginning I told them what I was doing and why I needed to read my Bible and pray. 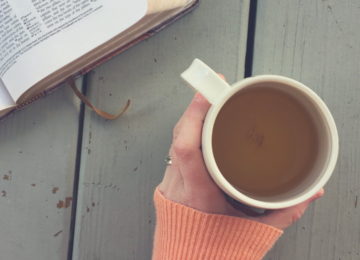 Here are some of the things that I’ve tried throughout the years to have quiet time to myself. Some have become more challenging with the addition of more children, but there are ways to keep your quiet time a priority. Get up earlier than everyone else. This doesn’t always guarantee quantity or quality time, but it certainly creates a good rhythm. 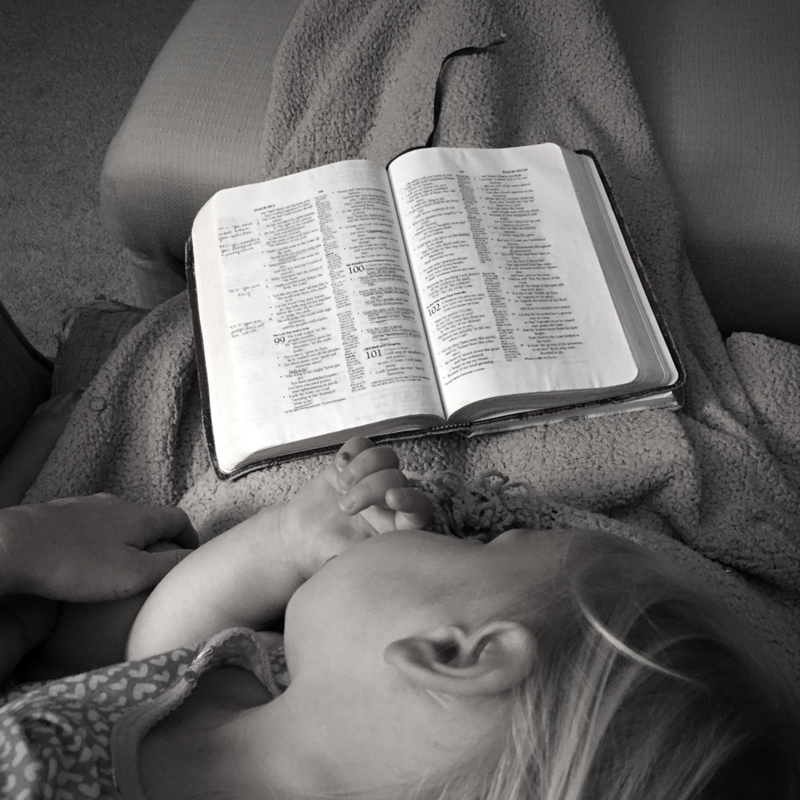 Give your children a Bible storybook, a stack of books, or a coloring book and let them sit next to you. Turn on a show for them to watch. I used to feel guilty about doing this, but a 30-40 minute episode isn’t forever ruining my children. Everything in moderation, right? Have a regular rhythm or routine structure to each day so that there are built in times when your children are either napping or playing by themselves, and take advantage of those chunks of time. Digest and savor what you can handle. In a perfect world I would have as much time as I wanted to sit and study my Bible. The nature of my life right now doesn’t allow for that, and sometimes exhaustion or overwhelming life circumstances make it difficult to do as much in-depth study as I would like. During the newborn phase when sleep was minimal, my brain couldn’t comprehend as much. In seasons of grief and significant change the only reading I could handle was a psalm or a simple verse, and then I would end up in tears, pouring out my heart to the Lord. No, I wasn’t pulling out a commentary and digging deeper into biblical interpretation, but you better believe I was growing in my relationship with the Lord. When we believe that God’s Word is living and active and equips us for life in Christ, then we must believe that taking in even little bits of the Bible at a time will not be wasted. Remember that this is a season. A day will come when you will have more uninterrupted time to study the Bible. Establishing good habits now will create a longing to learn more so that when you’re time increases you’ll be eager to use it for deeper study of the Word. Eat the meal that you can digest. Eat it up and savor it. Allow his Word to nourish you. Let go of the perfect quiet time scene. 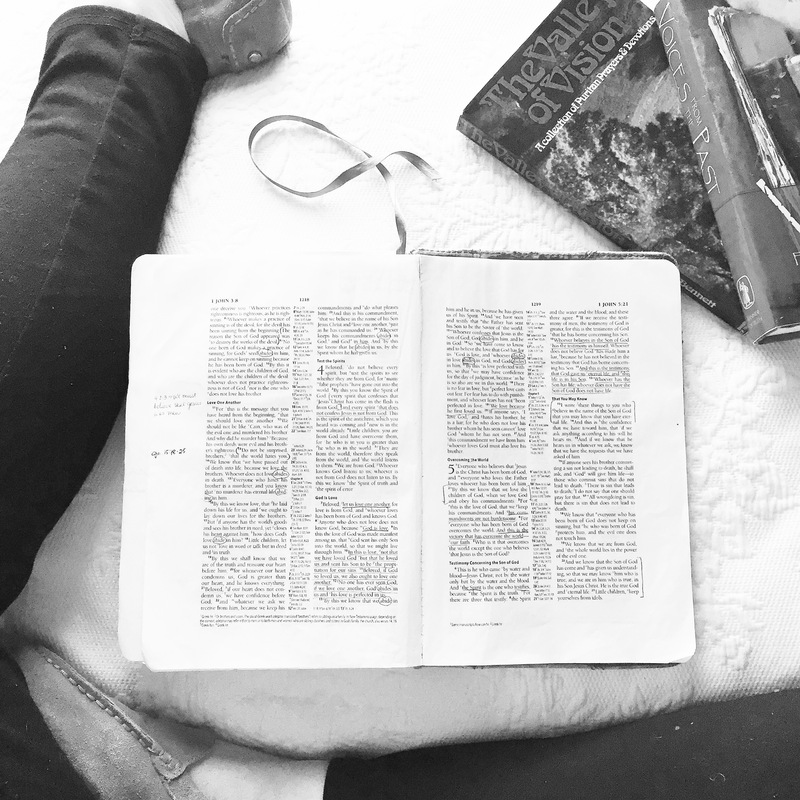 A big comfy chair, soft light, a fuzzy blanket, a hot mug of coffee, watercolor paints, fresh flowers, the sun shining on the pages of Scripture as you calligraphy your way through your Bible reading–you know what I’m talking about. I don’t know what kind of image comes to your mind when you think about having daily devotions, but the images that we see in our social media feeds can suggest there is a ‘perfect’ or at least a most desirable setting that will create what we need in order to have fruitful times with the Lord. These things are wonderful, and if you can incorporate them into your Bible reading and prayer with the Lord, then do it. But they are not necessary, nor do they mean you’re gleaning more from Scripture than someone else. While I do have my regular routine in the morning that creates a good environment for me–same chair, a nice lamp, a hot mug of coffee, a pretty journal– I often get distracted by my family. Lately, my quiet time scene involves Mason sitting on the portable toilet watching Octonauts in the same room, because we’re trying to potty train him. Sometimes I’m in the middle of wrestling through a passage of Scripture and it’s suddenly time to get everyone ready for school., so I have to set it aside and trust that the Lord will use the time I had to do a good work in my heart. With children there will be interruptions; this will be frustrating. But if we can let go of this image that we’ve created in what our devotional lives need to be or should be, we can learn to embrace what we have right now and make the most of it. Time with the Lord can happen anywhere. Leave your Bible open on the counter while you cook dinner. Write down a verse that you read and look at it throughout the day, meditating on it and allowing its truth to penetrate your heart. But don’t neglect the importance of abiding in Christ through reading and studying his word. The conversation with him begins there. Listen to him, pour out your heart, and savor his Word. You will not regret it. And you’ll be a better Mom as you grow to know and love him more. New here? Welcome! It’s my desire to encourage and equip what Deuteronomy 4:9 refers to as ‘a diligent soul’. One of the primary ways that I believe we can keep our souls diligently is to read and study the Bible on a daily basis. 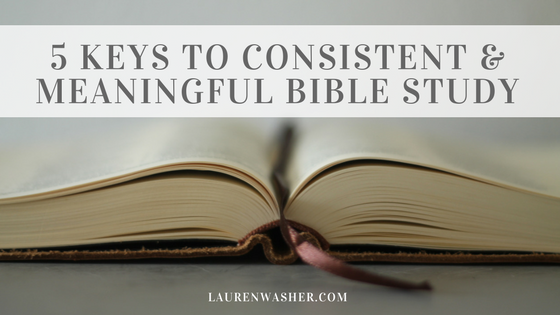 If you struggle to have consistent and meaningful Bible reading and study, I’ve created a resource for you: 5 Keys to Consistent & Meaningful Bible Study. Simply enter your email address and you’ll receive a copy in your inbox. You’ll also be signed up for blog updates and a copy of the monthly newsletter. Thank you for these! I so needed these tips, especially the one about not needing a beautiful quiet time “scene.” So often during the girls’ nap time I consider sitting down to study my Bible, but I think, “no, the environment is all wrong. There are toys on the floor and dishes in the sink. I can’t possibly study until everything is clean and a candle is lit and my coffee is hot.” If that’s my standard for a good quiet time, then it’ll NEVER happen! Also, I love the grace in allowing your child to watch a show while you study, and will try that today. I’ve struggled feeling guilty about that, thinking Ella should quietly read her own Bible for 30 minutes while I study. But that’s just not realistic of a two-year-old! Lol.